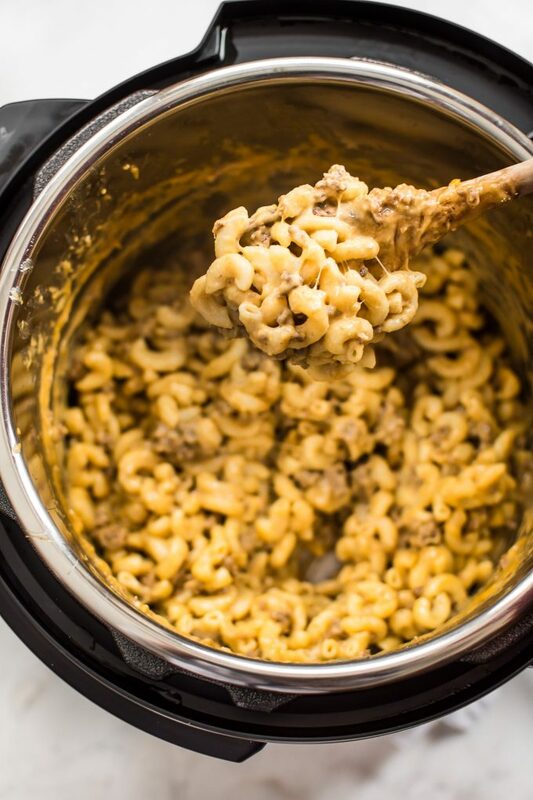 This easy Instant Pot hamburger mac and cheese is total comfort food that’s ready in only 30 minutes! No draining of the macaroni is needed, and it’s all made right in your electric pressure cooker. 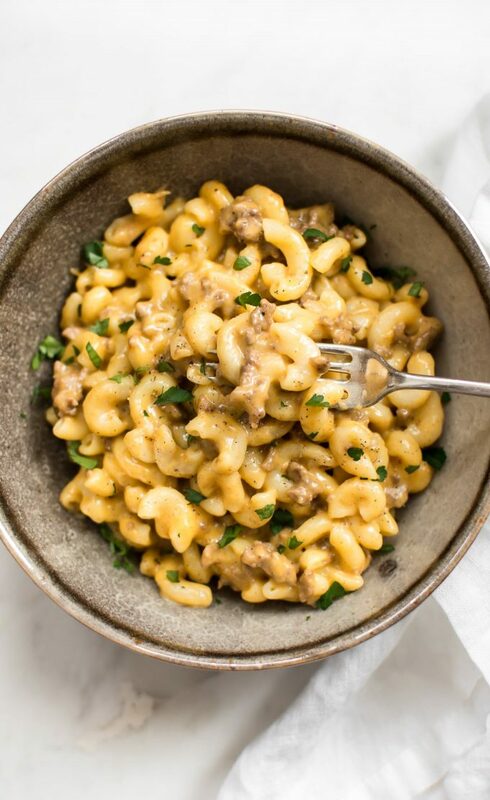 This beefy mac and cheese is one of those one pot meals that you’ll have on repeat if you like this sorta thing. 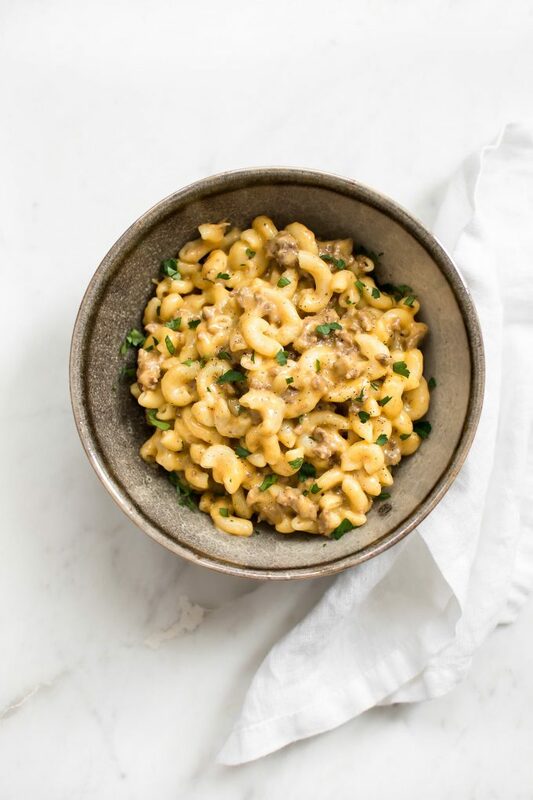 😉 This is a slightly more grown-up version of Hamburger Helper, but I can pretty much guarantee that any mac ‘n cheese lover out there will want seconds. This recipe is for the real cheese lovers out there. I used sharp cheddar as the primary cheese in here, and Gouda adds an extra layer of flavor and melty goodness. My simple spice blend of smoked paprika, ground cumin, garlic powder, and onion powder works in harmony with the Worcestershire sauce to make this dish a little more flavorful than just plain mac and cheese, but it’s certainly not overpowering. These additions make the ground beef taste more interesting, and, as a result, your taste buds will be very happy. 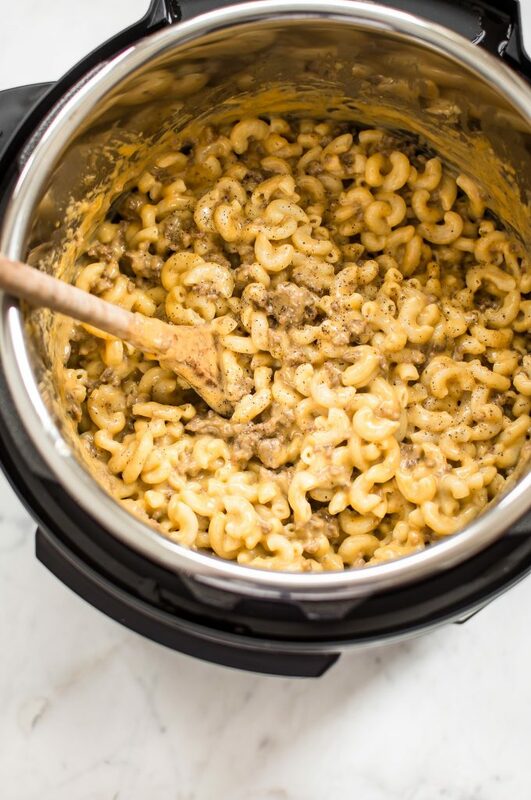 This beef macaroni and cheese recipe is cooked right in your Instant Pot, no draining required. Sauté the ground beef with the spice blend until browned and the liquid is reduced. Add in the macaroni and water. Cook on high pressure for 5 minutes. Meanwhile, grate your cheeses. Once the cooking time is up, do a manual pressure release. Stir in the cheeses and enjoy! If you don’t have an Instant Pot, this can be made on the stove as well. I put a few tips in the recipe card on how to do it. This cheeseburger macaroni recipe is perfect for busy weeknights, rainy days, winter nights, summer days, or anything in between. I hope you’ll give this beef ‘n mac recipe a try! Let me know in the comments below if you have any questions. 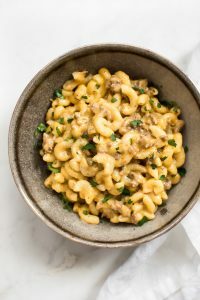 This easy Instant Pot hamburger mac and cheese is total comfort food that's ready in only 30 minutes! No draining of the macaroni is needed, and it's all made right in your electric pressure cooker. Stove top cooking tips: You can make this on the stove too. I suggest browning the beef in a large pot and cooking the macaroni as normal. Once the macaroni is cooked, drain it and then add it to the pot with the beef. Stir in the cheeses as directed. Love easy electric pressure cooker recipes? You may also like my Instant Pot beef taco soup or my Instant Pot chicken tortilla soup. Can I triple this recipe in the instant pot? What about the timing and water? Thanks! Hi Rachel! Hmmm it’s really hard to say without testing it, so take my suggestions with a grain of salt. Do you have a 6 quart Instant Pot or a bigger one? I don’t think tripling it will fit in the 6 quart. Doubling perhaps would, just make sure you don’t go over the fill line. I would keep the timing the same but double the water if you’re doubling the pasta. Do let me know how it goes! Hi Rachel! When you doubled did you double everything including time? Thanks! Hi Jenn, we can see if Rachel answers, but generally time should not be doubled on Instant Pot recipes. It’ll take longer to get up to pressure, and that compensates for any extra ingredients. Hello Natasha, thinking of trying to this one sometime this week. Just wondering if a regular pressure pot cooker will be okay to use? I’ve noticed that you use the electric ones and I’m not really sure about the regular pressure pot cooker. Thank you and you’re blog is outstanding. This recipe is definitely a family favorite! I make it, my mother makes it, my grandmother makes it (well, we make it at her house as she’s afraid of the manual release) – basically, everyone LOVES it! We’ve switched it up a little with smoked Gouda and also using buffalo instead of ground beef. Thank you for making this recipe and many other delicious ones I’ve tried from your website!! !